Pop-out side frame (RAW metal) each. Pop-out window frames Bus, the windows in the passenger compartment of the Spijlbus are performed wholly or partly with pop-out windows or windows that can be opened a few inches. There are few buses which the frames of the pop-out windows are still in good usable condition are rust here is the culprit. The frames are available as original made ​​of untreated steel that can be painted in the color of aluminum and what good terms with the rust problem. In this latest version is not only rust banned, you also create a very luxurious look after some further polishing even can get comparable to chrome. Gloss The metal frames are supplied without glass, for this you use the original, while the aluminum frames including glass are supplied however without rubber work, always take that extra in. The aluminum frames have the same outer dimensions as the original, only the glass is a millimeter thinner so that the frame could be done a little thicker and this has been like the metal version. Equal strength That is also the reason that the glass is included and you have your gift glass without scratching. 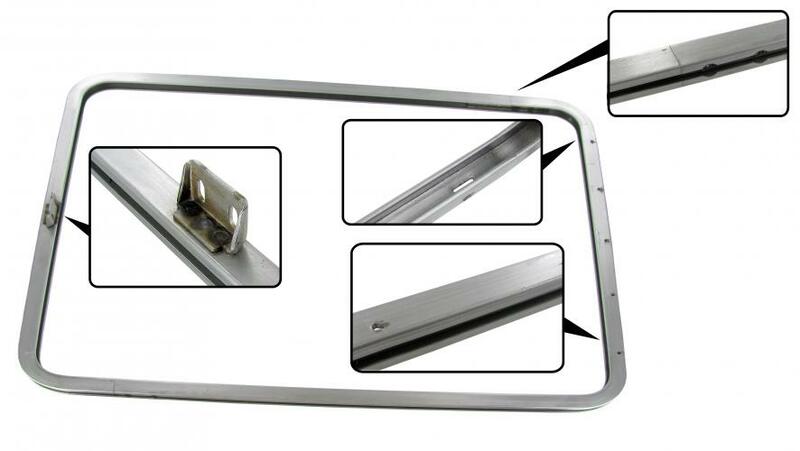 Both the metal and the aluminum frames are supplied individually. applicable to: Bus from 1954 (chassisnr. 20 76 673) »7/67 # 27414 untreated steel plus glass # 27422 polished aluminum including glass.